Unfortunately, sometimes the removal of the animal does not remove the danger left by its presence in your home. After wildlife, critters, animals, raccoons, birds or bats have been removed, damage repair services are provided for Cleveland and Akron homeowners. Feces and excrement, ringworm and other parasites create an ongoing health problem for your family and pets. 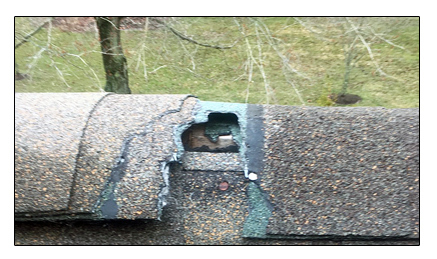 Torn attic insulation can cost a fortune in energy costs and holes and cracks in your roof, eves, soffits, vents and chimney can leave your building vulnerable to more wildlife infestations. In addition, your deck, shed, and porches are often areas where wildlife hides. We will remove them and repair any damage to those places as well. The fact is, raccoon and bat infestation and contamination is a serious danger to your home, health and safety and you deserve to be compensated for any wildlife exclusion and repair work done to your home or building. Our experience dealing with insurance companies gives you an edge when trying to get your claim covered. We will actively fight for you by talking directly with your insurance company and providing you with any materials you need to prove your case…because “Cottom Cares!”. Cottom’s Wildlife Removal is a local, family-owned and operated company that has been responding to the animal removal and home repair and restoration needs of families throughout Northeastern Ohio since 1986. Let us know what you need and we’ll be there… because “Cottom Cares!”.